Essential tremor is one of the most common movement disorders affecting an estimated 3% of the population, or approximately 10 million individuals in the United States. A new technology, called Focused Ultrasound, offers an alternative to traditional surgery that requires no incision or opening of the skull. You’re listening to ReachMD, and I’m Dr. Jennifer Caudle, and with me today is Dr. Gordon Baltuch, a professor of Neurosurgery and Director of the Penn Center for Functional and Restorative Neurosurgery. Welcome, Dr. Baltuch. Hello, and thanks for having me on the show. Well, we are thrilled that you’re here with us today. So, let’s dive right in. Can you tell us exactly what Focused Ultrasound is; can you talk us through that procedure? Focused Ultrasound is creating a very small thermal lesion deep inside the brain using a series of ultrasonic beams which all sort of magnify and coalesce in one spot. It is done in an MRI machine, so the MRI is used to target where you want to make this small thermal lesion, and you can also use the MRI to control the lesion itself, so the MRI will tell you exactly what the temperature of the brain is while you are producing this thermal lesion with the sonic waves, and it’ll feed back into the system to control the size of that lesion that you’re making. So, it’s really a thalamotomy, but in a very, very controlled fashion, and again, without an incision. Wow. This actually sounds quite remarkable and exciting. It seems like a really exciting new technology. Would you agree? Yeah. It’s a relatively new technology. There are about 30 machines now in about 10 different countries, and there have been a total of about 1,000 of these procedures which have been performed worldwide over the last number of years. It’s relatively new to the United States, and it’s really, really exciting because it really creates a new, and although not entirely risk-free option, certainly a different type of option which may be more appropriate than traditional surgical options for a series of patients; and you say, well who are the best candidates for this procedure? I think many of the people with essential tremor tend to be very senior, and that there’s significant comorbidity associated with performing sort of traditional surgery for essential tremor, which is deep brain stimulation, which we do a lot of, but it also has, as you know, has risk associated with placing the electrodes, and risk associated with the hardware, especially infection, and risk associated with general anesthesia; all of these things are not risks of this procedure, and so in a group of senior patients with essential tremor this can be a really tremendous option. That’s great, and I’m glad you talked a little bit about who might be a good candidate for this procedure. When should a patient be referred for Focused Ultrasound? What would let us know that it might be time for this? Well, the patients are referred from their neurologist. 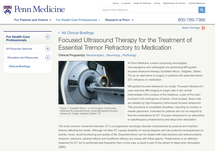 The first line therapy for essential tremor is medical therapy. It’s beta blockers and primidone, and then sometimes a few other medications can be tried, sometimes Topamax will be tried, or just topiramate, so the first line therapy is medical. The people who get referred are people who have usually failed two medications or cannot tolerate those medications anymore because of their side effects, who are having significant difficulty with activities of daily living, such as writing, holding utensils, dressing, putting on makeup, shaving in the morning, and these are the people who get referred for this type of procedure. That’s great. I mean, again, it sounds quite interesting and really fascinating in a way. 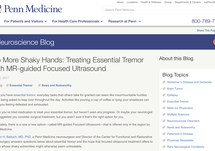 You’ve talked a little bit about who the appropriate candidates are and what the indications for the procedure, and you’ve also talked about some of the benefits, but maybe you could just kind of recap some of the additional benefits of Focused Ultrasound for essential tremor, maybe over other procedures or things like that. Well, the procedure can basically be done as a day surgery. The people come in in the morning. They get a stereotactic frame placed and they go into an MR machine for a procedure which takes about 3 or 4 hours, so it does require some time in an MRI machine, where you have to lie still, and it’s awake. Sometimes we get a little bit of IV sedation for part of the procedure just to keep people comfortable, similar to if you had let’s say a colonoscopy or something like that, you might have a bit of IV sedation for something like that. The amazing thing is the suppression of tremor is immediate; so the people come out of the machine and they can immediately see the result. So it’s really magic from that point to view. There’s a moment where you come out and the tremor is suppressed, and you can see that; that’s fabulous. We wind up having to still be very careful with this procedure because one of the differences between this procedure and deep brain stimulation, which is what I would say one of the increased risks of something that is a lesion is that there’s no eraser on the pencil. So, once you make the lesion, there’s no going back, it’s irreversible, as opposed to sort of deep brain stimulation whereas if you put the lead in suboptimally, you can always go back and try to put the lead in at a later date. Here, you have to be very, very careful to make a very controlled lesion that’s exactly in the right spot. What’s great, though, with this feedback control, which was much more difficult than traditional thalamotomies, was that here you can sort of make a sub-threshold, and I don’t want to call them lesions, but you get at lower temperatures, you can impact on those structures and see clinical effect, or see if there are adverse effects, and have an idea where you should be and where you shouldn’t be with respect to making your lesion; and that really is the art of lesioning is to make sort of a 3-dimensional thermal lesion in exactly the right spot and not outside of that spot. Right. That’s very interesting, and it’s interesting what you’re talking about, about the differences between this technique versus others, how, as you said, you can’t erase things, but at the same time it sounds like adjustments can be made in real-time as well when the procedure is being done. Is that an accurate kind of description of some of the ways that this works? Yeah, I mean, we think that this works in a similar way by disrupting sort of aberrant pathways or aberrant oscillations within the brain. It’s still not completely understood how either thermal lesions or deep brain stimulations actually does work; there are a variety of theories that are out there. Yes, it is at a certain level a form of empirical therapy, but that’s not unusual in medicine, that we have things that work really well and we don’t know exactly how they’re working. If you’re just joining us, you’re listening to ReachMD. I’m your host, Dr. Jennifer Caudle, and I’m speaking with Dr. Gordon Baltuch. We’re talking about Focused Ultrasound. So, let’s continue. Why is Penn the right place to be one of the first centers to perform Focused Ultrasound? We are very fortunate, and I think our leadership is very interested in innovation. We have been at the forefront of surgical therapy for movement disorders, and I think that our leadership wanted to continue that and invested in this technology, and I think that commitment from our leadership has been fantastic because we’ve have had the first machine in the Delaware Valley. So, I think it’s really, really exciting. It represents a considerable investment on the part of the institution, but I think for us it has been great. It does sound very exciting, and it’s very interesting that Penn is one of the few facilities that has this technology which you’ve discussed. Let’s talk a little bit about after the procedure. What can a patient expect, and what is followup like for that patient? Yeah, I mean, our followup for these patients is similar to other patients who have had surgical procedures. We see them in the same followup time. Some of the things that the literature has mentioned in the followups is some of the patients may have some transient numbness or paresthesias in their hand after the procedure. Some of the patients may have some balance issues for a week to 10 days after the procedure. We had one patient who had a bit of a weakness in that hand which resolved after the procedure. So, because you’re in an area of the brain in the thalamus in which there is a lot of very critical structures, you know, ascending sensory, descending motor fibers around, you may get some spread of swelling sometimes around the lesion which may cause some of those things. In some patients we’ve just had tremor suppression without any issues whatsoever. And finally, with this technology what is really the future of neurosurgery and other neurological conditions as we consider this technology? Yeah, unquestionably, neurosurgery is evolving towards less invasive-type procedures, and you can see that in sort of all disciplines of neurosurgery, whether it be sort of vascular, tumor, spine, and I think this is part of the general evolution that you’re seeing in neurosurgery in general over the… You know, I’ve been in this space now over 30 years, and the changes are remarkable, and honestly, I think it’s much, much better for our patients in terms of what we are able to deliver. So, Dr. Baltuch, we really loved having you today. Is there anything else that you would like to add? You know, I mean, I think this is very new technology which is, this is the beginning. I think we’re going to see much further development with the technology, not only the apparatus itself as a software along with developments in technology over time, but I’m also hoping to see developments and indications. We now have an FDA-approved indication for essential tremor, and I think the next thing is really to see whether we can use this in Parkinson’s disease, which is sort of our next step, and we’re hoping to enter a trial and to treatment for Parkinson’s disease, which remains investigational and not FDA approved within the next year. Well, again, this is very interesting and exciting technology. Many thanks to you, Dr. Gordon Baltuch. Dr. Baltuch is a professor of Neurosurgery and Director of the Penn Center for Functional and Restorative Neurosurgery. We’ve been discussing Focused Ultrasound. Dr. Baltuch, thank you so much for joining us today. You’re very welcome, and thank you for inviting me. 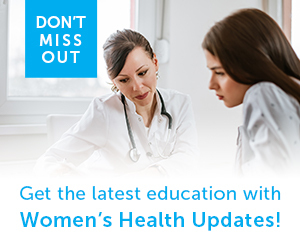 To access this episode and others in this series, and to download the ReachMD app, please visit us at ReachMD.com, where You Can Be Part of the Knowledge. We encourage you to leave comments and share this program with your colleagues. Thank you for listening. You’ve bene listening to Medical Breakthroughs from Penn Medicine. To download this podcast, or to access others in this series, please visit ReachMD.com/Penn, and visit Penn Physician Link, an exclusive program that helps referring physicians connect with Penn. Here you can find education resources, information about our expedited referral process, and communication tools. 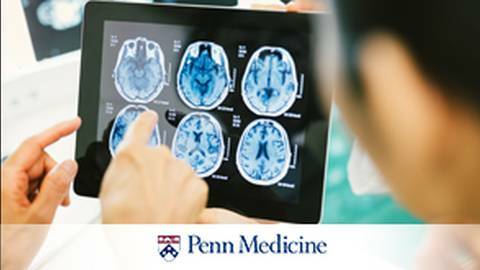 To learn more, visit www.pennmedicine.org/physicianlink. Thank you for listening. Dr. Gordon Baltuch explains how MR-guided Focused Ultrasound treats for patients who suffer from essential tremor. Essential Tremor is one of the most common movement disorder, affecting an estimated 3% of the population or approximately 10 million individuals in the United States. A new technology, Focused Ultrasound offers an alternative to traditional surgery that requires no incision or opening of the skull. 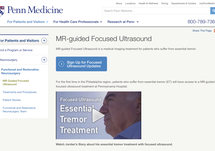 Host Dr. Jennifer Caudle is joined by Dr. Gordon Baltuch a professor of Neurosurgery and director of the Penn Center for Functional and Restorative Neurosurgery, to talk about how Focused Ultrasound is an effective treatment for Essential Tremor.